Steve G. Jones, Ed.D., Clinical Hypnotherapist, charges $1,500 for a custom recording and $25,000 for a one-hour private hypnotherapy session at his office. But you can get all the benefits for this low price. Simply listen to the Improve the World Around You Hypnosis MP3 every night as you go to bed for three weeks and feel the changes happening in your life. You will feel more empowered, more in touch with your true self, and you will truly know that your goals are within your reach. Steve G. Jones achieves AMAZING and LASTING results!!! Hypnosis is the easiest way to affect change in your life because the positive messages go straight to your subconscious mind effortlessly so you can accomplish your goals and reach for the stars!! All you have to do is listen to the Improve the World Around You Hypnosis MP3 audio at night as you go to sleep!!! You’ll hear soft music, the gentle sounds of the beach, and the soothing sound of Steve G. Jones’ voice all working together to bring about positive changes in your life easily and naturally. 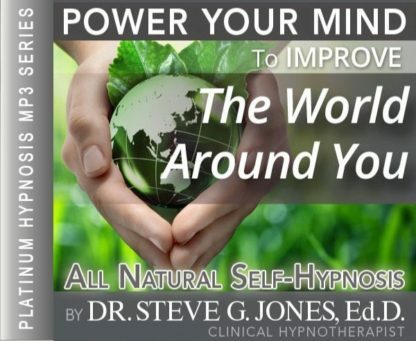 Steve G. Jones has been helping people improve their lives with hypnosis for over 17 years…now it’s time for him to help YOU… don’t wait, do it NOW !!! you’ll be glad you did. See you at the top! Do you ever feel the need to improve the world around you? So many people want to make a difference in this world, but many do not no where to begin. Something we can all do is to be a positive role model for others. People in your own community need support in various ways. I encourage you to help those in need of your compassion. I admire your will to improve the world around you. There is so much that is accomplished in this world by non-profit organizations. Perhaps you can improve your community by volunteering with an organization a few hours a week or a month. I encourage you to help in any way you can, but if you feel particularly drawn to a specific cause then you should pursue it. Other ways to improve the world around you include donating items to charitable causes, organizing fundraising events, or even starting your own non-profit. The possibilities in improving the world around you are endless. The important thing is for you to remain positive and put yourself out there! You are feeling very relaxed. Your entire body is at ease. As you lie there, your body relaxes, but your mind starts churning. You start thinking of all the different ways you change the world around you. You know you have complete control on how you view the world. You believe everyone in the world has hope and that everyone in the world can improve their lives. You start with changing your life first, so then you can improve everything around you. You look at people around you with hope and respect. You know that you, in your own lifetime, can touch thousands or perhaps millions of lives. Your outlook on life is a positive one. You know that you will have to work hard in order to make this world a better place. And you know that you can do it. You know that you can ask for others help and you know that they will be happy to help you. People are happy to help you because they believe in you. You have a good heart and you are able to accomplish great things. Once you change yourself by seeing the world in a different light, you will start seeing change around you. You will be motivated to influence others and you will see people doing good for others too. When you wake up, you will be excited about your day. You welcome challenge and you constantly seek to change the world around you. Throughout your day you are influenced by the people around you. You see the positive side of people and you are not weighed down by negativity. You constantly see the possibility of improvement. Not only do you try to change your world, but you inspire others to change their lives and the world around them too. As you go about your day you think of many ways to enhance your community. You enjoy making a difference. It makes you happier to see changes around you. You realize you can make a difference. Just one person, you are strong and capable. So go out there and make this world a better place. This powerful hypnosis program, the Improve the World Around You Hypnosis MP3 download, will help you realize that you are in control of the world around you. In the past it may have seemed that things were out of your control, but as you listen to this hypnotherapy session, you will realize that you are in control of your present and your future. You can and will improve the world around you with self-hypnosis. Improving the world around you includes improving any aspect of your life that improves your thoughts, emotions, and actions. You want to do everything possible to improve your happiness, health, wealth, and lifestyle. This hypnotherapy program will put you in charge of your world so that you can improve it and be happy with it. We suggest you listen to this Improve the World Around You Hypnosis MP3 recording for 21 nights in a row as you go to bed at night. Day by day, you will notice your world improving. You deserve to live in a world surrounded with happiness, love, and support. Hypnotherapy will help you achieve your ideal reality and improve your world.